The Japanese macaque, Macaca fuscata,is also known as the snow monkey. It is a tough monkey that lives in the high mountains of the island of Honshū in Japan. There are two things that make these monkeys different from other primates: they live in below-zero temperatures, and they like to warm themselves and relax in hot springs. Macaques eat fruit, flowers, seeds, bark, leaves, shrimp, and insects. Macaques weigh around 12 kilograms and can grow up to 70cm. They have short tails. 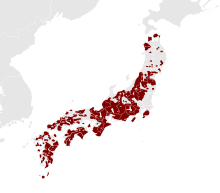 Wikimedia Commons has media related to Japanese macaque. This page was last changed on 6 March 2018, at 18:11.